Written by the elderly Saint John on the island of Patmos, some people think of it as John’s revelation. What it records is John’s angelic vision of Jesus Christ in his final work in the consummation of time. And it is a wonderful book that ties together so much of the rest of Scripture, including particularly other prophetic books like Daniel and Ezekiel. This writing has been subject to more extremes of interpretation than probably any other Scripture, as it is from a genre of literature known as “apocalyptic.” And our purpose today is not to detail any of that, but to look at the very final words of John – the concluding paragraphs of the Bible. The purpose of this revelatory account was to encourage the early churches, and by extension the church of Jesus Christ – the body and bride – down to our day as well, as this is God’s institution and work on the earth from the day of Pentecost until now, and until the rapture. Jesus is seen in fulfillment of Scripture as the offspring of David – speaking of his rightful place as the King – the King of Kings. Early in the morning, just before dawn, there is often the bright sight of Venus (or sometimes Mercury) in the eastern sky – a beautifully shining “star” that gives evidence that a new day is about to unfold. People think of the book of Revelation as all about curses and judgments, of which there is plenty of information. Yet it also contains an extraordinary amount of promises and blessings for those who will trust and follow the Lord. The Gospel is an open invitation and the gift is free indeed to all who will come and take of it. No judgment in the book has to fall upon anyone, if only they will come to God through Christ. These verses are of special interest for our Framework study. The scroll being talked about is in specific reference to the Book of Revelation, but the truth and concepts here would apply to all of Scripture. God’s Word is complete, it is finished, it is final, and it is perfectly sufficient. Adding to it by coming with a Bible in one hand and a bible in the other will put a person in line for the very destruction spoken within for those who do not accept and obey God’s revealed truth. And failing to acknowledge all of it – like accepting only those parts that are politically correct and make current cultural sense – also puts an individual on the other side of the line of truth. Do you feel that way? Are you looking forward to that? Have you lived and cumulatively suffered enough of the inevitable sadnesses of this life – physically and otherwise – to be very much ready for the Lord’s return? I know this: it gets easier to have this very viewpoint the older one gets! With each passing day, this looks better to me than the day before … the week before … the year before. Yes, Christ’s coming would be a great thing! What are the differences between these sets of words: I’LL REST and ILL PEST? There is quite a difference in meaning, but honestly not that much in form and the use of letters. The apostrophe makes the difference between I’LL and ILL, while the little descending line in the letter “R” makes the difference between REST and PEST. Tiny marks and strokes in written languages can make a big difference between words. 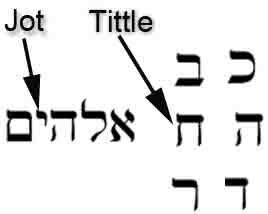 And when Jesus in the Sermon on the Mount spoke of (in the language of the King James Version) jots and tittles, he was speaking of little marks in the Hebrew language that were like apostrophes, and of small dashes that distinguished one letter from another. Not only was Jesus saying that the content of the Old Testament Hebrew Scriptures was true, it was fully reliable down to the very smallest portion of the letters of the words. There can be no doubt from the entire record of Christ’s statements that he saw the Scriptures as God’s perfect revelation to mankind. If we call someone today a “Pharisee” we have debased them and criticized them for being arrogant and pompous in belief, speech and action. It is a negative. But at the time of Christ, the Pharisees were respected and generally held in high regard for their precise observance of Scripture. Along the way, they had also codified thousands of actions that were precise (and often ridiculous) requirements to fulfill the Law. And they worked very hard and very publically at being the very best. But here is the problem: nobody can be perfect about everything, not even a blue-chip Pharisee batting clean-up on the Pharisaic all-star team. Jesus is pitching a new set of fast balls right past them – upping the standard… such as not just avoiding adultery, but being guilty because of lust. Throughout the chapter, Jesus burns them over and over with their platitudes (“You have heard it said…”), and the chapter ends with the statement that they need to be perfect as God is perfect. And again, there is the problem. The purpose of the Law was to set a perfect standard of God’s righteousness, showing that it could not be met … that it could only be covered (atoned for) in blood. And Jesus came to be the perfect sacrifice, fulfilling the Law and paying the price of sin on behalf of those who could not do it themselves. Christ offers his righteousness for those who will trust and receive it. This fulfillment of the Law down to its finest and smallest points is what Christ came to do, and it is indeed the good news – the gospel of salvation from the grind of works and deeds that could never really make the standard. All of this points to the precision of Scripture – from dozens of writers over hundreds of years. And it all ties together in one great message and theme of God’s salvation in the righteousness of Jesus Christ. On this day that I write these words, I found myself in a very melancholy mood at the weekly pastoral staff prayer gathering. Conversation around the table featured a couple of items of behavior in the current culture that I simply cannot relate to at all – items that struck me as antithetical to the Christian life and leaking across appropriate lines that separate the markings of a follower of Christ versus the mere stuff of this world. I find myself more and more out of touch with the ebb and flow of what is popular and valued – things esteemed often for reasons I simply cannot imagine. I fear being old and disconnected, especially in an era that seems to more quickly than ever disregard loyalties to the tried and true, turning rather with an A.D.D. sort of bored disinterest in favor of anything that is young and new. Exterior excitement certainly trumps internal substance. I feel like a Rolex in a world where the iWatch unveiling has essentially doomed me and my Scriptural substance values system to the back corner of the old socks drawer in the bedroom dresser … good for memories, but not exciting enough for where life is going. In some fraction, I helped to change the Christian church world by jumping from the traditional structures of my youth and being part of the leading edge toward “contemporary” modalities. The preaching and teaching component at that time did not change regarding the value, authority, and perfection of God’s Word … though it is true that my generation of communicators pressed to not just teach what the Bible said to the original audience and the theology inherent with it, but to go the next step and flesh out the practical applications for a modern world. But after us came a new wave of exciting communicators who used the Scriptures as a launching point to talk about applications that were not necessarily always supported by the original teaching and intent. It is like laying a foundation for a three-bedroom ranch house, but then building a larger contemporary structure with multiple levels of stone walls, heavy timbers, and glass atriums and overhanging balconies. It was beautiful to look at for a while, but eventually the foundation gave way, and great was the fall thereof! In the last month, several prominent faces of externally successful church ministry around the country have had more than a few structural faults exposed. It was inevitable when the foundation – the framework – was not appropriately valued. Wow, those first five verses really do sound like a description of our present age – self-centered and self-focused people who cunningly build empires around themselves, looking like something, claiming to be something. It was like two characters named Jannes and Jambres – who are not biblical names, but rather referred to a very common and well-known Jewish legend about two of Pharaoh’s magicians who opposed Moses. They looked really good for a while, but eventually the smoke and mirrors caught up with them, as they did not possess substance. The fact is that the faithful life of serving Christ is not going to be easy. Paul suffered greatly and was even stoned and presumed dead, but he recovered and walked back into Lystra to finish his sermon! There is going to be opposition both from those who hate the faith, and difficulties from others who are impostors within the walls. The need is to stay faithful to the Scriptures. God’s Word is the foundation that will stand. It is perfect in every detail and timelessly profitable in any situation. The Scriptures fully equip a person who knows what they teach to address any and all contingencies. But to be equipped, one has to know what they say. One has to make the Bible and the study of it to be a lifelong passion and pursuit. It is not enough to get some general ideas and run with them toward your own desired application. The Bible is a framework in a world gone crazy, and truly we live in such a world.